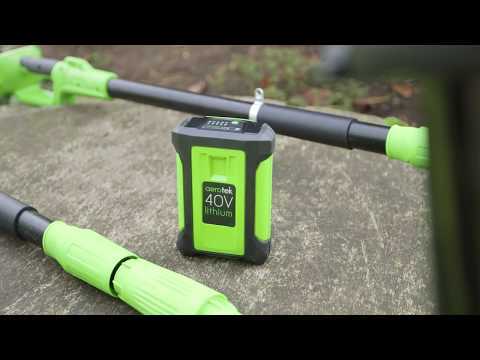 40V Lithium-ion battery – With just one 40V rechargeable lithium-ion battery, you get the same cutting performance as a corded or petrol hedge trimmer, without the hassle. Brushless motor – The highly efficient brushless motor drives the blades and requires next to no maintenance. If you’re fed up with having different batteries and chargers for all those different garden tools, then we have a solution. We have designed our quick charging battery to work with the whole Aerotek Garden Power Range. There is no need to spend ages filling up a tank up with petrol, devoting time and effort to maintaining an engine and no messing around with potentially dangerous cords, thanks to our powerful, cordless hedge trimmer. Simply pop in the powerful 40V lithium-ion battery and at a press of a button you are ready to go. This innovative battery will give the same performance as petrol or corded garden tools, without the hassle. The battery even has a handy indicator light allowing you to see exactly how much life is left. One full charge will give up to an hour usage. Spend less time working and more time relaxing thanks to the extra-large 500mm cutting length, that will let you cut through branches quicker and more effectively. There is also a 16mm cutting capacity to allow you to cut through branches up to 16mm thick with ease. Thanks to the cordless nature of this hedge trimmer there is no need to worry about being connected to a power source or accidently tripping over an unruly cable, giving you the freedom to work anywhere you may need to. Whilst you’re hard at work you can enjoy using this lightweight model as at only 2.7kg it’s both easy and comfortable to use. Included in the box is one Aerotek Hedge Trimmer with safety guard, a 24-month warranty and full instructions. Please note: This product is not supplied with a 40V battery or charger, these are available to purchase separately. Once purchased the 40V battery and charger are compatible with our entire Aerotek Garden Power Range.